The Phoenix is the next generation product from Stone Mountain. Uncompromised quality, unsurpassed customer support and by far the highest value for your investment – From light business to the harshest public safety, military and industrial applications, the Phoenix platform is the ultimate solution for your most demanding speaker microphone needs. Designed, Assembled, Tested and Supported with Pride in the USA. Ready to Buy? Please select your options below to get the speaker mic you want. Don’t see your preferred configuration? Call 1-888-244-9306. Waterproof, Mil Spec speaker mics for Law Enforcement, EMT, SWAT, Firefighter, Military, Security, Medical, HAZMAT. Business, Light and Heavy Industrial, Hospitality, Casino etc. applications. Uncompromised quality, rugged construction and boasting several standard and optional features – The new Phoenix series is by far the best value speaker mic on the market. Waterproof – Built to IP68, 1 meter for 31 minutes. • Designed to meet full Mil 810 C, D, E, F & G specifications for use in the harshest environments. • 50mm Neodymium speaker for unsurpassed audio clarity and Sound Pressure Level (SPL). 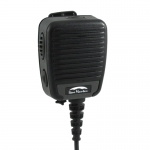 • Ultra sensitive, high gain omni directional microphone for crystal clear transmit audio. • Optional AllClearTM dual microphone, active noise cancelling system. • Optional Emergency Button (on certain radio models) and volume control. • Features WhisperTekTM sub audible Tx audio system for enhanced Voice Intelligibility. • Features OutLoudTM high Rx audio output speaker system for enhanced Voice Intelligibility. • Features SureSealTM 2.5mm and 3.5mm sealed accessory jacks. 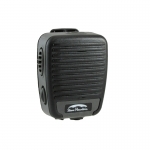 • Optional SureTactTM one touch system to disable speaker mic Rx and/or Tx audio when a six pin Hirose accessory is connected. Supports remote RX, TX and PTT. • Interfaces with the full line of Stone Mountain Omaha Rx, Tx & PTT accessories. • Highest quality fully interchangeable polyurethane cables, machined high strength brass ferrules and aircraft grade fluorosilicon o-rings. • Overmolded ergonomic design for the ultimate user comfort during prolonged use. • Fully field repairable / replaceable parts. • 100% gold plated PCB’s for unsurpassed performance and reliability. • Two (2) year warranty. • Designed, Assembled, Tested and Supported with pride in the USA. Microphone Sensitivity -40 dBV (0dB=1V/Pa) WhisperTekTM Tx audio system. Speaker Output Power 1 W (Dependent on radio brand/model). Speaker Output Level (SPL) 100 dB SPL (dependent on radio brand/model) OutLoudTM Rx audio system. Accessory Interface SureSealTM 3.5 mm & 2.5 mm for remote Rx audio or 6 pin Hirose for remote Rx, Tx, and PTT functions. Auxiliary Button SureTactTM System. Controls various radio and/or accessory related functions. Dimensions 79 mm x 65 mm x 29 mm, not including belt clip. Operating Temperature -30°C to 60°C. Storage Temperature -57°C to 80°C. Volume Control Hi/Lo with 12 dB volume delta. Rotating Belt Clip 360° with positive detents every 45°. Cable Assembly Flex Life 50,000 cycles minimum. AllClearTM Noise Cancelling System – The PHOENIX AllClearTM speaker mic utilizes two omni-directional microphones and active circuitry to boost critical signal-to-noise (S/N) ratio. Emergency Button – Not available on all models. Dependent on the communication system and radio. MagShieldTM – The MagShieldTM is a custom engineered acoustic shroud designed to significantly reduce/eliminate ingress of metalized filings and dust into the speaker cavity without degrading or decreasing speaker output level. The new PHOENIX supports the full line of Stone Mountain OMAHA Series audio accessories, including D Ring and Surveillance kits, ProTectTM Noise Reduction System, Tactical Headsets, Over and Behind the Head Ear Muff and Boom Mic systems, 1, 2 and 3 wire kits, etc.